Dame Zaha Hadid was awarded the Pritzker Architecture Prize in 2004 and is internationally known for her built, theoretical and academic work. Born in Baghdad, Iraq, in 1950, Hadid studied mathematics at the American University of Beirut before moving to London in 1972 to attend the Architectural Association (AA) School where she was awarded the Diploma Prize in 1977. 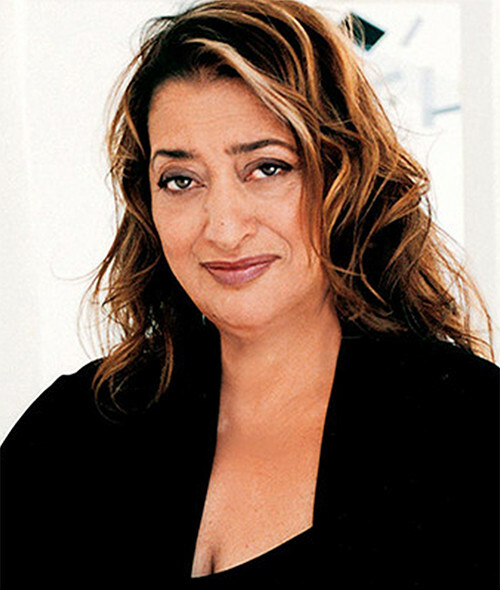 Hadid founded Zaha Hadid Architects in 1979 and completed her first building, the Vitra Fire Station, Germany in 1993. Hadid taught at the AA School until 1987 and has since held numerous chairs and guest professorships at universities around the world including Columbia, Harvard, Yale and the University of Applied Arts in Vienna. The MAXXI: Italian National Museum of 21st Century Arts in Rome, the London Aquatics Centre for the 2012 Olympic Games and the Heydar Aliyev Centre in Baku are built manifestos of Hadid’s quest for complex, fluid space. Zaha Hadid’s work of the past 30 years was the subject of critically-acclaimed exhibitions at New York’s Solomon R. Guggenheim Museum in 2006, London’s Design Museum in 2007, the DAC Copenhagen in 2013 and the State Hermitage Museum in Saint Petersburg in 2015. Hadid’s outstanding contribution to the architectural profession continues to be acknowledged by the world’s most respected institutions; in 2010 and 2011, her designs were awarded the Stirling Prize by the Royal Institute of British Architects. Other awards comprise UNESCO naming Hadid as an ‘Artist for Peace’ whilst TIME magazine included her in their list of the ‘100 Most Influential People in the World’. In 2012, Zaha Hadid was made a Dame Commander of the Order of the British Empire, and in February 2016, she received the Royal Gold Medal. Zaha Hadid passed away on the 31st of March 2016, her legacy endures within the DNA of the design studio she created.